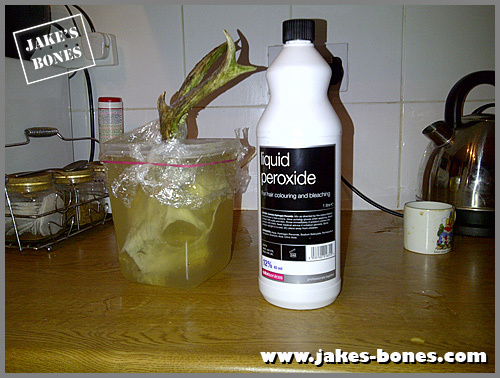 You are here: Jake's Bones > I have written a totally new 'cleaning bones' section ! I have written a totally new 'cleaning bones' section ! Back in 2009 I wrote a post about how to clean animal bones. It has been one of my most successful posts ever with lots and lots and lots of visitors, over fifty comments so far, and I get about three or four emails a week just asking for advice on cleaning bones. But it's three years old and I've learnt a lot more since then, so it's a bit outdated. I'm on half term at the moment so I spent the day completely writing a new guide which has almost everything I know about cleaning bones. You can read it here or by clicking the "cleaning bones" tab at the top of every page. Hope you like it ! Thats a great entry and very helpfull for a lot of bone colectors! I totally agree with your methods in all points. I have been looking for this! I love your blog! Especially the sea eagles! I found ( ok my 4lb dog found a possum skull lol) she wouldn't stand a chance against a real live possum. Anyway Its just the jaw bones and I wanted to electroplate them with metal and incorporate them into a mixed media jewelry piece. Thanks for the tips Jake! You are awesome! Your post from 2009 is really useful, thanks! I have a sheep skull that got in July but I haven't got round to cleaning it yet because I wasn't sure how. Now I've read your post about cleaning animal bones I will certainly get round to cleaning it sometime in the half-term holidays! Did this red deer calf die last winter ? I need your help for two future blog posts !